The Central County Fire Department offers three courses that teach important skills. For more information about these opportunities, call (650) 558-7600. Offered by the Central County Fire Department (CCFD), the Get Ready course teaches you the basics of emergency preparedness. This three-hour class is packed full of useful information. It is free for Burlingame, Hillsborough and Millbrae residents. This training may be taken in lieu of the first CERT course. The best way you can get prepared for large and small emergencies is to take Community Emergency Response Team (CERT) training, a 20-hour course offered by CCFD free of charge to Burlingame residents. The course is offered on six evenings or mornings, followed by a “Skills Day” on a Saturday, when you’ll practice what you’ve learned with authentic-looking “victims.” If you miss a class, you can make it up in another city. These classes fill quickly. Sign up for the free CERT newsletter and CERT alerts by emailing Suzanne Tateosian at suzanne@earthshakes.com. 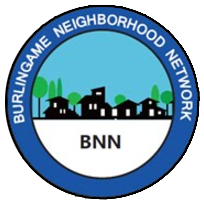 Learn more about Burlingame’s CERT Group here. Experienced staff from the CCFD will train you how to give cardiopulmonary resuscitation (CPR) to an adult, child or infant; how to use an automated external defibrillator (AED); and how to help someone who is choking. Your training could save a loved one. When computers and telephones fail during an emergency, amateur radio operators (Hams) will be able to connect us with our local emergency operations centers and the outside world. You can learn to become a Ham radio operator in one day through the Bay Area Educational Amateur Radio Society (BAEARS). The cost is $35. Local Hams can also help you find inexpensive radio equipment. To learn about upcoming courses and to pre-register, go to baears.com and click on “Upcoming Sessions” at the top. Learn more about Burlingame’s Amateur Radio (Ham) Network.